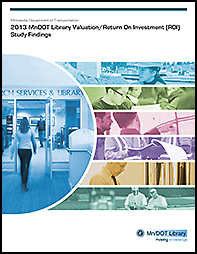 MnDOT Library conducted a valuation/ROI study in 2013. Final materials are available here. This study was recognized with the 2014 Innovation Award from the Special Libraries Association-Transportation Division and the 2014 Innovation in Action Award from the Special Libraries Association-Minnesota chapter.